In February, our very own Bill went to advise at the Smart Data Hack in Edinburgh. This was a 5 day event that involved undergraduates splitting into 16 teams to make apps using open data. Ewan Klein arranged it; it was well attended and, eager to encourage our love of data and its uses, we put up a prize of £250 for the best app that used government data. And Bill said competition was high - you can read more detail on the different projects here but the winning team was called Go4itPrincess with their MSP Involvement Project. Their app examines how much Scottish Members of Parliament speak up and on what topics. 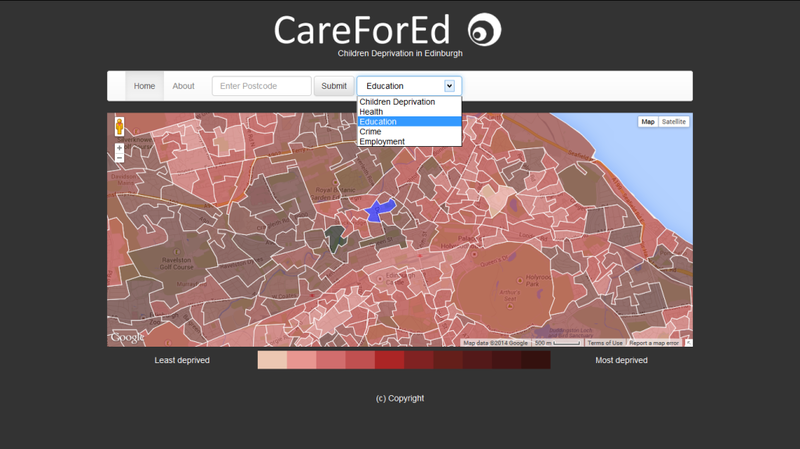 It then aims to analyse any correlation between that and their constituency’s rankings on the Scottish Index of Multiple Deprivation. Pretty creative data use - kudos princess(es?)! And projects aside, one of the things that Bill found most impressive was that the students could get to grips with SPARQL for extracting their data. And they were generally happier retrieving data from APIs than having to download files and manage them themselves - showing just how accessible API use can be. If you want to get more of an insight about the hackathon, check out tweets from the event and the screenshots below (thanks to the OKF Scotland blog), which show some of the great apps created.